We are manufacturing specialty Hand Sanitizer with hand cleanser which helps to clean oil, grease hands, blood stains, etc stubborn smells. just take 1-2 drops on your hand clean your hand with clean tissue paper or cloth. You will not feel stickiness in your hand. After that you don't have to use water or soap. We are only manufacturer of this product in all over the world. We are manufacturers of Hand Wash. In our Hand Wash we add special moisturizers so that even after washing your hands you will not feel dryness. It kills all germs which harms our health. We provide Hand Wash with different Colors and perfumes. Hand Wash is available in three different colours: Pink, Blue and Yellow with flowery, colon and lemon perfume which rejuvenates us. We also customize Hand Wash on client’s request as customer satisfaction is our first priority. Added Silver Nano particles which is highly antibacterial and removes bacteria like Ribosome Destabilization, Cell wall Disruption, Free Radical Formation and Intercalation between DNA Bases. We are Manufacturers of Hand Sanitizer. 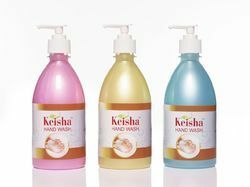 Keisha Hand Sanitizer contains 70% alcohol with a special blend of vitamin-E moisturizers which not only kills all the germs but also moisturizes yours hands and makes your skin soft. The added Chlorhexidine di gluconate kills all harmful germs which can cause illness. A light layer of moisturizers with a touch of perfume remains to condition the hands which rejuvenates us. We also customize Hand Sanitizer on client’s request as customer satisfaction is our first priority. Looking for Hand Cleanser ?